The WinFence cross-section extension module of StrataExplorer can be used to quickly create detailed full color cross-sections. The environmental version of this module has been specifically designed for the environmental industry. A wide variety of strata can be used to create cross-sections. Depending on the industry, types of strata that can be used include layers, faults, lenses, intrusions, and alteration zones (mineralization, contamination, hydrocarbons, shear strength). 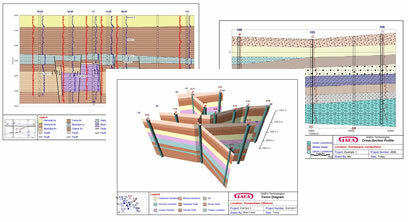 Very detailed and complicated stratigraphy can be represented and easily drawn. This module shares the same database as the boring log module and can be used to access and plot the boring/well data. A wide variety of boring/well data can be plotted on the cross-sections; including lithologic symbols, sample symbols, core logs, well diagrams, graphs, and geophysical logs. There is the option to have the program automatically generate the cross-section using artificial intelligence (AI) built-into the program. 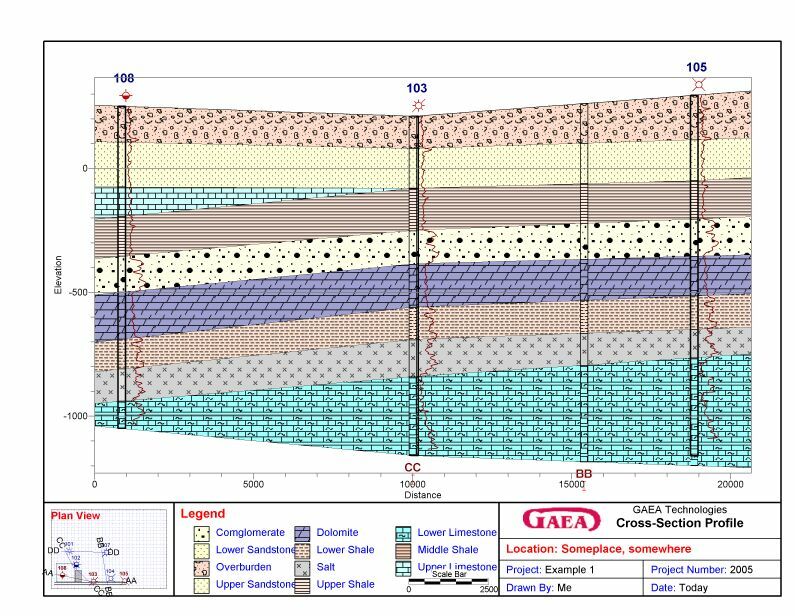 When determining how to connect the strata between boreholes, wells, and intersecting cross-sections the program looks at the similarities in the lithologies, thicknesses, and occurrence of the strata. This methodology works well with most geologies; except, where the geology is very complicated or there are faults. A unique snapping approach can be used to add layer, alteration zone, intrusion, and lense boundaries. This approach allows the boundary of one strata to be fixed to the boundary of another strata. Making the input of strata boundaries quick and accurate. Boundaries can be partially drawn and partially snapped. Snapped boundaries can include one or more different strata. In addition to snapping, strata boundaries can be assigned to the strata above or below. After the cross-section has been created, the strata boundaries can be used to create contour maps in the contouring and gridding module. 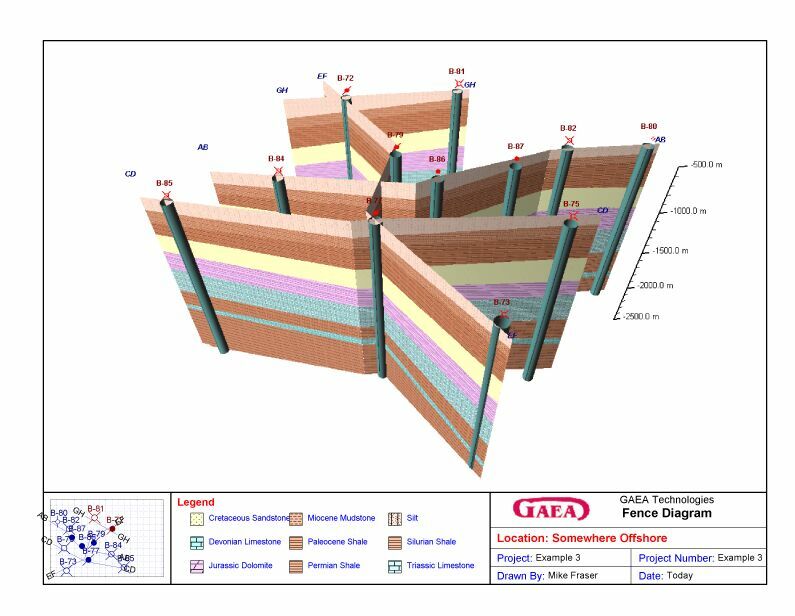 In addition, the cross-sections can be displayed in 3D as fence diagrams. 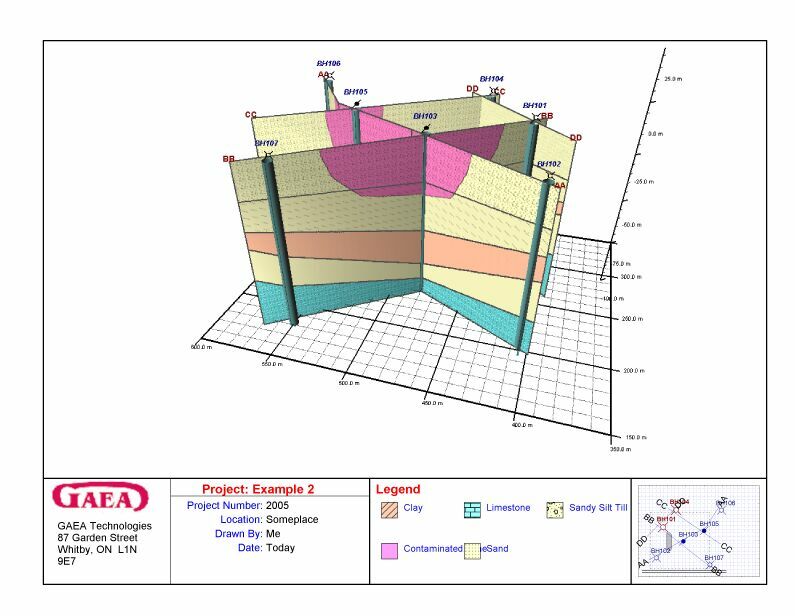 EDMS sample and concentration data that is associated with a boring or well can be displayed on a cross-section at the location of the boring/well. Strata in cross-sections can be automatically generated by the programs built-in intelligence. 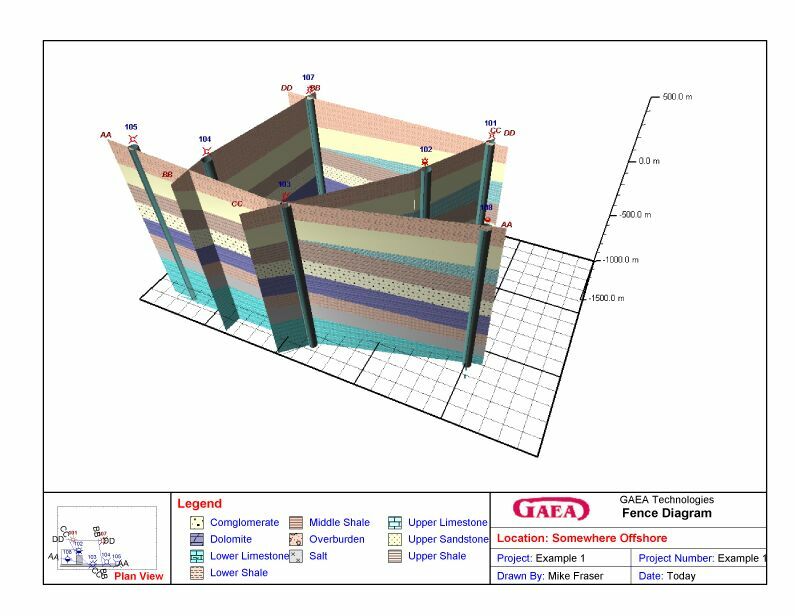 Fence diagrams can be generated, displayed and printed in 3D. Multiple water levels can be drawn on the cross-section. The water level can be drawn automatically using the water levels stored in WinLoG. Grid nodes from contour maps are displayed on the cross-section and can be used to automatically adjust the strata boundaries. Strata boundaries can be used to create contour maps in the extension contour module. The automatic creation of cross-section strata has been improved with tighter links to the boring/well module. Cross-sections can be included in page layouts for a project and shown either individually or as part of a montage. Cross-section path line can be straight or bent. Intersecting cross-sections can be displayed on a cross-section. Intersecting cross-sections can be used when automatically generating a new cross-sections. 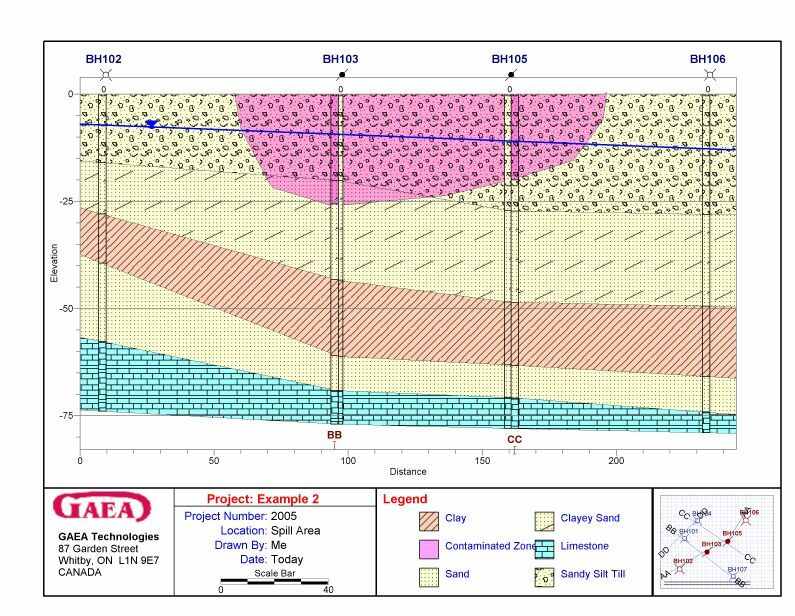 Cross-sections can use data entered in the boring/well extension module to show lithologies, graphs, geophysical logs, samples, and well details at borehole locations. Strata from the boring/well extension module are automatically added to the cross-section. Cross-sections can contain an unlimited number of layers, lenses, and intrusions. Strata boundaries can be connected by straight lines or a curve can be fitted to the boundary. Boundaries can be snapped to other layers or intrusions. Points defining strata boundaries can be graphically edited and deleted. Horizontal and vertical scales of the cross-section can be specified or automatically fitted by the program. The types of data that can be displayed and features depend on the industry version. To see a list of features and data types for each industry version click on the link below. Below are thumbnails showing some of the types of cross-sections that can be created with WinFence. Click on a thumbnail to see a full-screen picture. There are a variety of licening options available for WinFence. If the licensing option you require is not shown please us and we will be happy to proivide you a quote.